HOUSTON, Texas, May 5, 2011 (SEND2PRESS NEWSWIRE) — Already internationally known for perfection in diamond cutting for their A CUT ABOVE® Super Ideal Diamonds, Whiteflash has just added several perfect D Color, Internally Flawless (D IF) diamonds to their elite category. Believing that diamond connoisseurs and collectors seeking the ultimate diamonds desire not only perfect color and clarity, but perfect cutting and light performance as well, Whiteflash has just delivered to the market some of the most immaculate gems in the world. Cut and polished with advanced technology to excruciatingly exact specifications, the A CUT ABOVE® Hearts and Arrows Super Ideal delivers the absolute maximum fire, brilliance and scintillation technically possible in a diamond. 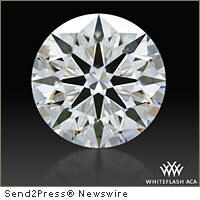 The newest member of the Whiteflash “Circle of Perfection” is a 2.106 D IF A CUT ABOVE® Hearts and Arrows Super Ideal selling for an impressive $124,987. In order to be awarded the A CUT ABOVE® brand a diamond must first be certified as Triple Ideal by the American Gem Society Laboratory, the preeminent authority on diamond cut quality in the world. From there it must pass additional light performance testing and evaluation by the Whiteflash team of gemologists. It is estimated that only about 10 percent of AGS Ideals are fine enough to earn the A CUT ABOVE® Super Ideal designation, making it one of the most exclusive diamonds in the world. D IF A CUT ABOVE® represents the “holy trinity” in Diamonds: Perfect Color, Perfect Clarity, and Perfect Cut – the epitome of diamond beauty, rarity and exclusivity.